Sprint legend Usain Bolt was left in disbelief when Australia’s anti-doping authority (ASADA) sent a drug test notice to the retired Jamaican athelte. After retiring from athletics last year, the eight-time Olympic champion is currently working to build a new career in the football arena. However, Bolt is yet to sign a deal with Australia’s A-League club Central Coast Mariners, where he is currently on trial. 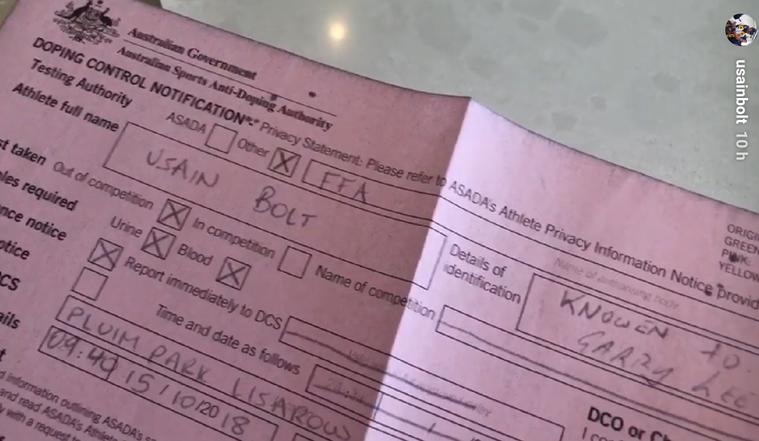 Releasing a video on Instagram on Monday, Bolt said, “So guys I’ve retired from track and field looking to become a footballer but look at this,” as he zoomed in on the notice sent by the Australian ant-doping authority. As per the notice, it appears that the Football Federation Australia has asked the athlete to submit his urine and blood samples. “How am I going to get a drug test today? I’m not even a professional footballer yet. Seriously. So I asked the lady, ‘Why am I getting drug tested when I haven’t signed for a club yet?’ and she said they told her I’m an elite athlete so I have to get tested. Okay then,” Bolt further said in the video. According to report in news agency AFP, Bolt is eligible to be tested under ASADA guidelines. Bolt recently scored two goals for the Mariners in a pre-season friendly against Macarthur South West. Bolt, who has also attended the training session with German football club Borussia Dortmund, has been offered a chance to train with Mariners for an indefinite period in order to pursue his dream.